So I've now read 3 Austen novels. I feel quite accomplished. Some time ago, I broke my 'books before movies' rule with Austen's other books because I never thought I would get round to reading them. Silly me. I have read Persuasion, which I loved, and picked Northanger Abbey as my next Austen because I absolutely, no shame, love the movie. I have seen it like 17 times. The guy who plays Henry Tilney is also in Austenland, be still my fangirling heart. Northanger Abbey is definitely not Austen's most popular work, which is why I thought I wouldn't like it. I was so wrong. I truly love this book, I daresay it ties for second place with Persuasion in my heart. But considering I have only read 3 of Jane Austen's novels and P&P will always be #1; it seems all the others will tie for 2nd place. Based on their film adaptations, Mansfield Park will be my least favourite. This book has some real, heartfelt drama and romance, but mainly I like it because it's really, really funny. Catherine is awesome and kind of nuts, and the supporting characters run the gamut from really likeable and charming (Eleanor and her brother Henry) to excruciatingly irritating and shallow (John and Isabella). Austen makes fun of the (then) popular Gothic novels and authors who spurn novels. Henry is quite possibly Austen's cheekiest character. If you don't know the story, it's basically as follows: young 17-year old Catherine Morland accompanies the wealthy Mr. and Mrs. Allen to Bath for her first introduction to Georgian society. She meets the charming Henry Tilney and sociable John Thorpe who both vie for her attentions, and befriends John's sister Isabella and Henry's sister Eleanor. She meets General Tilney (Henry's father), who mistakenly takes her for an heiress. After the whirlwind social life of Bath, she is invited by the Tilneys to their country estate, Northanger Abbey, where - due to the influence of her fondness for gothic novels - she thinks up some fanciful ideas about the General. She falls in love with Henry, but her fancies and the General's discovery of her family's true social standing land her in trouble and threaten to tear her and Henry apart. Northanger Abbey shows how life is, a simple over-imaginative girl finds love even though she is not the most clever, most pretty, most smart. She never pretends to be anything she isn't and puts to shame those who do. Northanger Abbey is a delightful read and I highly recommend it, that is, if you want to. If not, just watch the movie. Or Austenland. That's good too. Have you ever liked a book after seeing the movie? I've actually never read or seen Northanger Abbey! I will have to add that to my list! lol P&P will always be my favorite book ever....I re-read it at least once a year. haha! I haven't read this one yet but my grandma bought it for my boyfriend (he wanted to start reading more "classics" - currently he's read precisely zero of the ones she's given him!) so I probably will eventually. ok, how do i have an eng lit degree and have never read this?? remedying that, stat! How did I not know there was a movie version of this book?! I have read it a couple times and really liked it! Of course it's been awhile and I don't remember it, so that means I need to read it again! Every time you do an Austen post I go "D'OH I still haven't cracked open P&P"! One day, one day! I usually try to read before I watch. Or if I watch, I don't read! I love Northanger Abbey because Austen discusses the importance of novels (through the characters). I think it's awesome because at the time novels weren't considered art! Austen sure proved them wrong! Ok, another one to add to my list! Thanks ... I have about a week over Xmas break with no kids so I can read and watch all the movies in my jammies:))) Heaven!!! That sounds like a good one! I try to never ever ever see the movie first. But I did love Gone With the Wind after seeing (and hating) the movie. I tend to want to read the book first but if I don't plan on reading the book I'll watch the movie. Sometimes the movie has inspired me to read the book though. I always try to read the book first, but then I rarely like the movie once I've read the book! Usually I like the book better even if I see the movie first. I like being able to read and imagine the characters and the setting in my mind and when the movie doesn't match what's in my head it makes me irrationally angry LOL! From your review it sounds like I need to read Northanger Abbey! Congrats on finishing your third Austen book! Get it girl!! 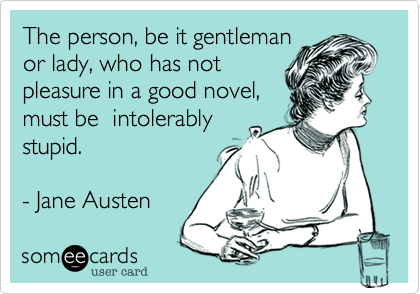 Hahaha, love that quote, Austen is brilliant! I haven't actually read the book of this one yet, but love the movie! One day I will read a Jane Austen book - maybe a snowy winter day I will download Pride & Prejudice and finally read it!!! Good lord I totally forgot I read this until I read your description. College killed my brain, too many books. Northanger Abbey is a great one, but I've never seen the movie version!! I've seen all the other Austen works but not that one. Which is such a disappointment to me because I really enjoyed the book. Emma is actually my #1 Austen, Persuasion falls far back into last place. That book just really didn't do it for me. I've actually never even heard of Northanger Abbey! Don't kill me! Now I really want to see the movie! I don't think my brain is smart enough for the book since P&P was so confusing to me haha! I'm such a sucker for the perfect opening line, and I really like that one! I might have to think about adding this to my list for next year, even though she's really not my genre. I WILL (re)read P&P eventually just for you though. Also, that ecard? 100% truth. I love JJ Field!! I play Austenland in the background all the time because I love him in it. I'm definitely going to watch Northanger Abbey. I mean, I will probably eventually read it too, but now I have to watch it asap! I don't think I've ever watched a movie prior to reading the book now that you mention it. I've seen trailers for movies that have made me want to read a book though... does that count??? Wait, how have I not seen the movie for this one? I have read this one. I think it's my least fav that I've read so far. I have never gotten into these books but maybe I should start. I have a bunch of friends that are obsessed. You're slowly and surely convincing me that I need to read a Jane Austen book. 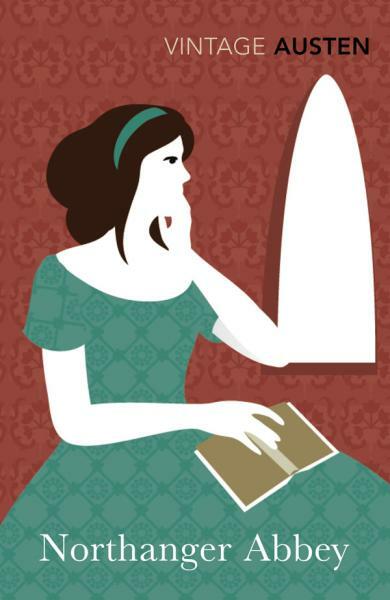 It's been a long time since I've read Northanger Abbey, but I remember really liking it. To be honest, P&P was a book that I gave another chance to after seeing the Joe Wright adaptation. Now it's one of my favorite books and that movie is one of my favs (as in 2nd favorite of any film I've ever seen). I actually can't think of a time when I've read a book AFTER seeing the movie, except for Pride and Prejudice!! And I think it helped me enjoy the book more because for me, getting into the mindset of that era of writing is kind of a challenge and between the book and some context from the movie I had a better feel for what was going on. I think there may be something wrong with me. I enjoy the plots and characters of Austen's work via various adaptations, but I really do not enjoy her writing. I didn't know anything about the storyline for this one but it sounds really good! I need to go search for the movie too & Persuasion! I actually really like the Mansfield Park movie, but I've heard it's not very true to the actual story? Aw I also always thought it would be disappointing - haven't picked it up yet - but now you're making me want to right away! Worst thing is I saw a copy yesterday at the bookstore and also bought it! Silly me! "If it's Ted Cruz that's the candidate, he's in,” Gardner said. air jordan shoes australia There was once a saying in presidential politics that there are “three tickets out of Iowa”: If a primary candidate finished fourth or worse in the Iowa caucuses, air jordan australia his campaign was kaput. But super PACs have changed the game. I actually read "Atonement" after seeing the movie. I loved both!